Guess what I’m doing? Well, you don’t have to guess. I’m writing you a letter. Duh. ‘Why?’ you’re wondering. I have no idea. I could very email you or text you or something or a kiss smiley would pretty convey everything this letter will only in fewer words. 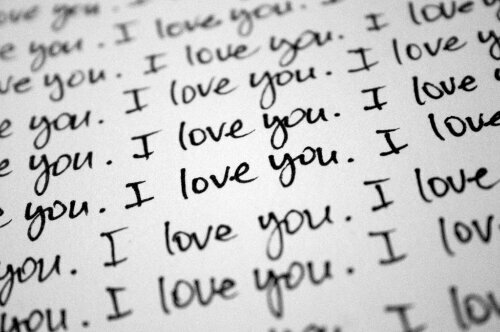 The thing is, I love you. Everyday I wake up assaulted by the immensity of my love for you. Some days I’m burdened by the ridiculousness of my emotions for you given the circumstances. Some days I’m terrified of the immense stupidity of my feelings for you. Most days, I’m thankful. Happy. In love. I didn’t care much about God until I met you. In fact I still don’t care much except when you’re around. You’re a manifestation of God to me. You, me & our love, my very own holy trinity. You’re proof that he exists. You never give up on me or doubt my ability for greatness. I know its a one time thing, this love we share and I promise to never take it for granted. I’ve considered loving you like Saturday morning cartoons over waffles. Sweet. Comfortable. You have a smile that is sunny side up and takes me by surprise every time. I love your corny jokes. I love you so much I almost hate you, love you. I find that it is important to tell the people you love how much you love them while they can hear you. So I’m going to tell you every moment I can. Like a fat kid loves cake. Or well, how I love cake. Like enough to not be mad if you eat the last slice of my red velvet cheesecake. The day you were born is my Valentines day because that is the day my love was created. I’m glad you came into my life when you did because me two years ago would never have been able to comprehend the sheer brilliance that is you. I’m not saying our thing has been without problems. We’ve had problems. I’ve questioned whether loving anyone this much is smart. I know its not. But I don’t care. YOLO right? You’re my fairy tale. Everyday is a happily ever after with you in it. You’re my happy ending. I love . . .well I’m sure you know what comes next. At least the mush is over FINALLY!!! !